From Thomas Sabo is this Silver and Turquoise Ring. A colourful ring that taps into the latest trends. A perfect addition to any outfit, taking it from day to night. The Thomas Sabo Silver and Turquoise Ring Size 58 features a slim band design. The ring is embellished with Turquoise stones, all of the way around the band. It is a perfect ring for stacking with others alike. This Thomas Sabo ring would be a perfect gift for her. 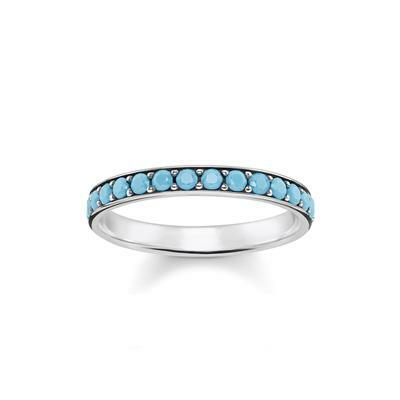 This ring is crafted from 925 Sterling Silver and Turquoise stones.